The movements differ significantly in how concrete they are. The civil rights movement had tangible obstacles to overcome. They could individually fight by daring to sit in the wrong place, marry the wrong person, move into the wrong neighbourhood, go to the wrong school.... By contrast, the OWS movement is ineffable. It's harder for individuals to use small daily acts of bravery to take it down. There are things that people can do, but they're not as visible, not as public. We don't all notice how many people are in on it, so it's hard to gather speed. On the bright side, because we can't make those small daily public acts, maybe this movement can be less violent. Maybe we can effect change without anyone getting hung or raped or stabbed. In the states, there was about as much violence during Black Friday shopping sprees as there were at the protests. 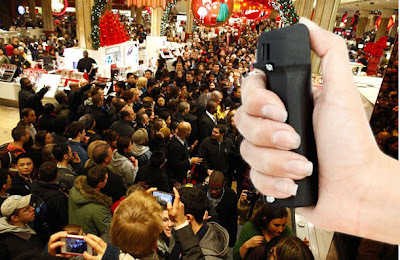 This is the pepper spray revolution!